I’ve lived in Reno, Nevada, USA for 15 years and one thing that has confused me is the identity of main north-south freeway through northern Nevada. To most it is known simply as ‘395’ and it is the only north-south freeway between I-5 in California and I-15 in Utah. When I first moved here I sometimes mistakenly called it I-395 because it is a freeway (access only by on or off ramps); however, the ‘395’ is officially ‘US 395’. Recently I learned that the road does have a federal designation, which is Interstate 580 or I-580; however, no where on the freeway can you find signage for I-580. Why? For decades Nevada Department of Transportation (NDOT) has been working to upgrade US 395 into a north-south freeway from Hallelujah Junction north of Reno (in California) through the communities of Reno and Carson City with the ultimate plan to continue it south of Carson City. The Federal designation for this upgrade has been Interstate 580 or I-580. 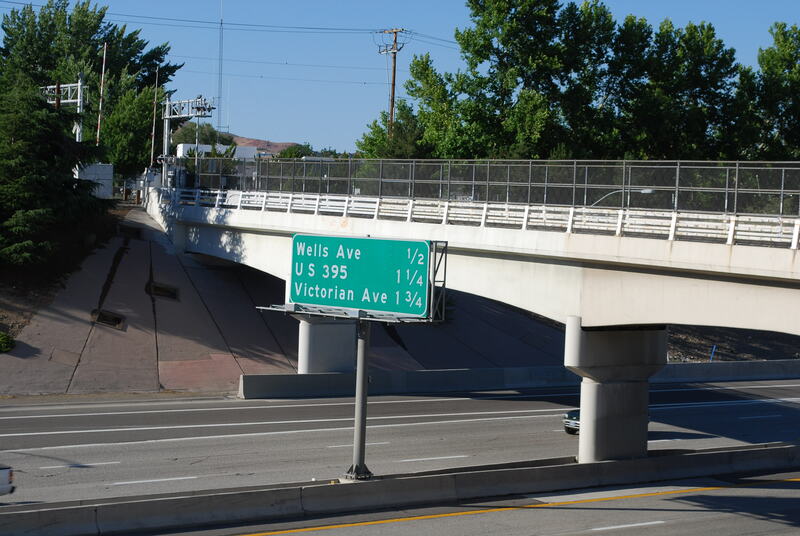 According to one source, at one point in the 1980’s signage was put on the section of I-580 in Reno; however, for unknown reasons it was removed. Thus, Reno has an Interstate that is not identified as such, and is still known by an identifier associated with highways. I actually don’t care what designation it is given, but it is an Interstate and I’m interested in how long it will take before it is referred to by its correct identifier. Rumor has it that once the link between south Reno and Washoe Valley is complete the I-580 designation will be finally given to the Interstate, but I’m not holding my breath. Nevada schools are consistently the worst in the nation, so learning new things is not a popular sport in this State. I guess I shouldn’t be surprised by confusion over I-580. Nevada has a long history of avoiding reality. Just try using the correct pronunciation of Nevada (Ne-va-da) and you will have every native acting like they invented the Spanish language and tell you it is pronounced Ne-vad-duh. Locals get to decide how to pronounce names. They know it’s not the Spanish pronunciation; it’s the Nevada pronunciation. Do you know how to pronounce Cairo, Illinois? It’s not like it’s namesake in Egypt. I’ll leave it to you to go there and be instructed by the confused locals. There are no I-580 signs yet because it hasn’t been designated as part of the Interstate system. It will be when the extension to Carson City is completed. The only confused one seems to be you. Maybe after another 15 years you’ll figure it out. Good luck. Thanks for the clarification on the timing of the I-580 designation. That is what I had heard and noted in the article. As for the ‘locals get to decide how to pronounce the names’ comment, that’s not really correct. While it is correct that pronunciation of a word or name is determined by the standard usage, there are micro, local, regional, and universal determinations of usage. This means that while the universal accepted pronunciation of the Spanish word meaning ‘snow-covered’ is Ne-vah-da. Anyone can pronounce it a different way, but that doesn’t make the micro, local, or regional pronunciation with the ‘duh’ correct. The State’s name is Spanish, not English, because the State was part of Alta California until a little over 150 years ago when we took the land from Mexico at gunpoint. People can beat there chest and ‘correct’ people who pronounce name as it is universally accepted, but that is their problem, not mine. I haven’t gotten back here in a while. I find your response interesting, but I don’t fully agree with it. I’m aware of the Spanish origins of Nevada, but the origins are irrelevant. The people of Nevada have chosen to pronounce it differently, and it is silly to say everyone in Nevada is wrong. It’s not a matter of chest beating. Local usage does count. There is more than one correct pronunciation for many names and words. It depends on context and location. By the way, did you check out the ‘correct’ pronunciation of Cairo, Illinois? If you didn’t, they pronounce it ‘Kay-row.’ If you go there and say it like its more famous cousin in Egypt, they will smile and laugh under their breath the same as a Nevadan will when you say Ne-vah-da. I probably wouldn’t have an issue with how any individual chooses to pronounce any word, but it is too the point of comical how certain people in Nevada overreact when they hear the State’s name pronounced as it is said throughout the world. If I’m speaking in front of a group in Nevada and I want to get a gasp, a shaking of the head, and a stern correction afterward, all I have to do is pronounce the State’s name correctly. It’s not that Nevadan’s prefer to pronounce the word that way, it’s that they actually believe their is no other to pronounce it. We live in a State with the highest violent crime rate per capita for two years running, the highest unemployment, the most foreclosures, one of the lowest rated educational systems in the United States, an underfunded infrastructure, and a tax system that gives a free ride to the wealthy…and what are the people concerned about?…..How to say ‘vad’ when you pronounce the State’s name. I don’t mean to be unreasonable, but I think people might need to start looking beyond how the news anchor in New York says Nevada. Sorry if I’m sounding confrontational. Again, thanks for taking the time to respond.